Convert DVD to PSP for playback on your players. DVD to PSP converter for Mac is developed just for Mac OS X (include Mac OS X 10.5 Leopard, Mac Intel and Mac Power PC) users to convert DVD videos to PSP MP4 (MPEG -4) or H.264 video format and extract audio from DVD to PSP perfectly. 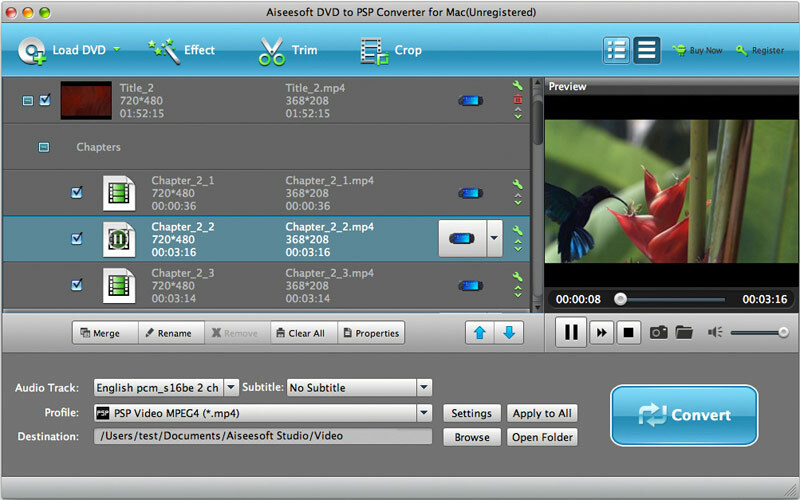 This powerful Mac PSP converter provides various settings such as selecting any chapters or titles to convert, selecting DVD movies subtitle and audio track, trimming DVD title or chapter, setting video brightness, contrast, saturation, and even joining all selected DVD movies titles or chapters into one file. Convert DVD movie to PSP and watch your favorite movies on your PSP player! A professional mac psp converter designed for Mac users. Convert DVD movies to PSP video and audio on Mac OS with excellent output quality. Convert DVD movies to PSP with any available language on your DVD by selecting the subtitle and audio track you prefer. DVD to PSP Converter for Mac is allows you to convert DVD movies to PSP on Mac with just a few steps. Why Choose DVD to PSP Converter for Mac?